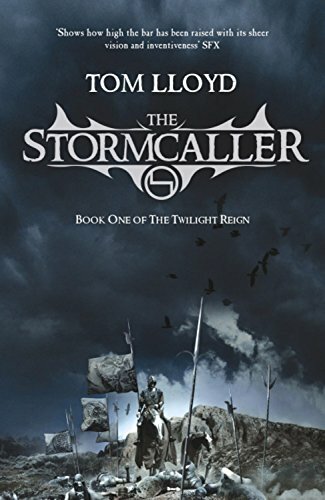 Having bought The Stormcaller a number of years ago and after reading only the first few chapters, it somehow found its way to the dark and dusty recesses of my bookcase where it has remained until resurfacing this year – an event owing more to my forgetfulness than to the quality of the writing. Following the unearthing, reading, brief vacation abandonment and ultimate completion of the first of The Twilight Reign series, I am now on a mission to track down and read them all! The Stormcaller is, in simplistic terms, a coming of age fantasy. Isak is a White-Eye, a boy who is gifted (though most in The Land would say cursed) with superhuman strength, innate prowess in battle and more than a handful of magic. From humble beginnings, Isak’s life is changed completely when he meets the legendary Lord Bahl. As he fights for the people who would have once shunned him; Elves, Dragons and the Gods themselves become embroiled in the battle to fulfil or destroy prophecy. Tom Lloyd’s debut is a gripping read which (if you ignore the part where I put it down) I couldn’t put down. Though I would have enjoyed more development into the motivations of the characters in the opening chapters, the novel sets a good pace and every moment moves the story along. Similarly, I would have enjoyed pulling at the tangled web of intrigue which develops throughout the book, or being fully immersed in scenes which, though only mentioned in passing, remain crucial to the plot. But true to the pace set I was whisked along with Isak, and through blood, battles and the gathering of the storms found myself deposited at a satisfying conclusion which ultimately left me wanting more. Now I better get my hands on The Twilight Herald…. before it slips my mind.